The biblical story of the Holy Innocents is told in Matthew 2:13-18 with Herod’s death squad murdering all children age two and younger living in and around Bethlehem because the wise men told him a king was born there while they were following the star. It’s an unsettling story, to say the least. Was Herod mentally ill? Did he want to hold onto his power, position or wealth? There are always so many unanswered “why did he do it” questions after mass murders like this one. 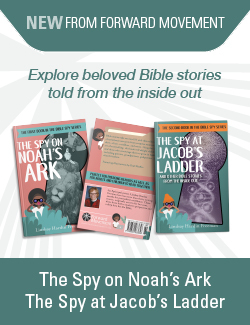 All we know from Matthew’s text is that Herod decided children must die, and thus children were killed. The Feast of the Holy Innocents is not a day that lends itself to traditional family celebrations. Today I am not offering you craft projects to create with grandparents who are still in town or recipes to prepare in the warmth of kitchens you’ve used so much over the past few days. Instead, today I ask you to consider all the innocent children who continue dying today at the hands of greed, power, hatred and injustice and what you are doing to ensure fewer parents know such pain. Who are our contemporary Holy Innocents? It’s estimated that Herod ordered the deaths of 14,000 babies and toddlers the week after Jesus’ birth. This number seems unfathomable. Or at least it does until we put it into a modern context. Since the massacre at Sandy Hook Elementary in Newtown, CT on December 14, 2012, nearly this many children and teenagers have died by gunshot. According to the Brady Campaign to Prevent Gun Violence, every day, 48 children and teens are shot in murders, assaults, suicides & suicide attempts, unintentional shootings, and police intervention. Every day, 7 children and teens die from gun violence. These are our Holy Innocents. Abroad we look no further than Aleppo, Syria to see numbers of innocent children dying at rates comparable to Herod’s time. The images we’ve seen are heartbreaking. Parents carrying the limp bodies of their babies. Children wailing over their siblings’ body bags. A stunned five year old boy covered in dust and blood sitting with his feet dangling over the edge of an ambulance seat. Rather than being raised to a soundtrack of education, laughter and outdoor exploration, the children of Aleppo are saddled with the sounds of constant gunfire, explosions and weeping. These are our Holy Innocents. So as parents, what do we do? I encourage you to use the extra time you have with your children over Winter Break to explore the lives of modern day Holy Innocents. It could be the children dying in Aleppo or the American children dying from our country’s addiction to firearms. It could be the world’s 10 million children under five who die annually from malnutrition or hunger related causes or the 1.2 million children who are trafficked each year around the world. Learn some of their stories. Learn some of the contributing factors to their deaths. Learn what you can do to ensure fewer parents know such pain. I’m spending today with my five and seven year olds exploring the lives of children sacrificed on the altar our country has created out of guns. We will write letters to our newly elected congressperson asking him to support gun law reforms like universal background checks, extreme risk protection orders and restricting access to high capacity magazines. 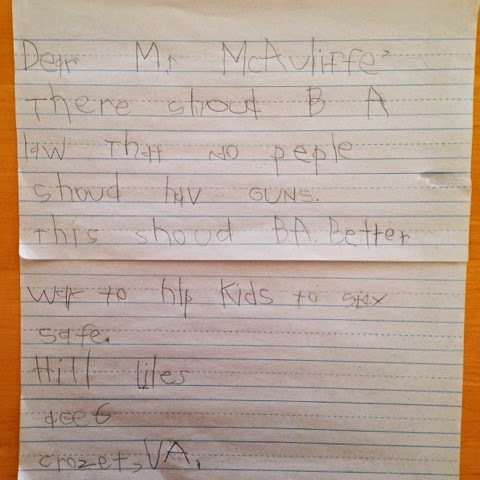 A letter the author’s son wrote to the governor of his state as a six-year-old. We will once again revisit our family’s rules on playing with toy guns and always asking about unlocked guns before visiting someone else’s home. And we will pray, pray, pray. Upworthy.com published a list of seven organizations working to alleviate the suffering in Aleppo, many of which would appeal to young children. Unicef has a trafficking fact sheet complete with a “what can I do to help?” for families to use. Episcopal Relief and Development focuses on agriculture and their Gifts for Life program alleviates hunger and increase food supplies in the developing world. We must remember that the problems facing Jesus and the Hebrew prophets involved public issues such as economic justice, relief for widows, orphans and refugees and fair treatment of all those living on the fringes of society…. addressing the suffering of the innocents. 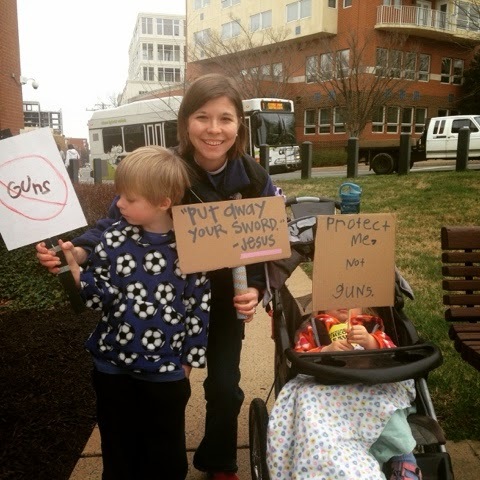 The author and her children advocating for businesses to become gun-free zones. The suffering of innocent human beings is a religious issue. Relieving such suffering is an imperative of our faith. 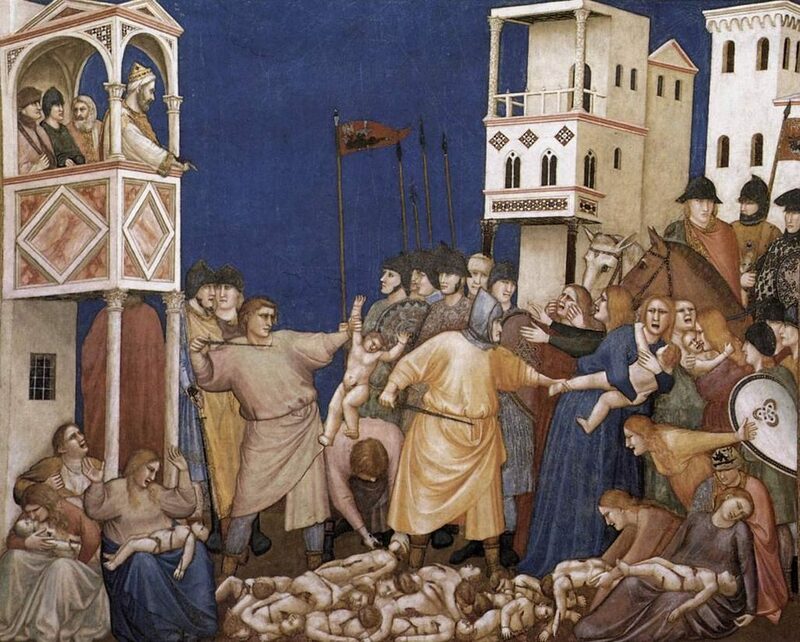 What do you suggest as an observance for Holy Innocents Day? What will you do? Thank you very much for this powerful and still, unfortunately, timely post. The last sentences truly sum up how we should look at this ongoing problem: “The suffering of innocent human beings is a religious issue. Relieving such suffering is an imperative of our faith.” If we can see this in those terms, maybe we can begin to see the changes we seek and so desperately need. For Peace on Earth for the sake of our children. All I can say is AMEN and AMEN! Thank you for bringing the innocent children into our modern day context.